The 2014 US Open kicked off yesterday at Pinehurst, marking the second major of the PGA season. 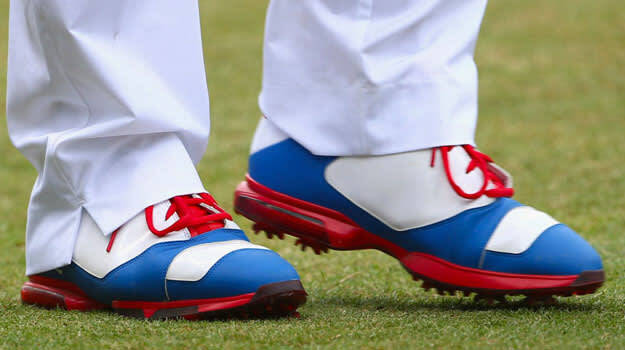 Going into the tournament, Keegan Bradley is considered a favorite in the field, and even if he doesn&apos;t win, he will have the best shoes on the course this weekend. Bradley has been with Jordan Brand for quite some time now and is often a playing partner with Michael Jordan, who may just like golf more then basketball. Keegan took to his Instagram to show off his custom Jordan golf shoes that he will wear throughout the tournament in two different colorways. No official word on the name of the cleats or if they will ever hit retail, but with photos of the Jordan 11 golf cleat, and the Jordan 1 golf shoe showed off by MJ&apos;s son Marcus, it&apos;s becoming more evident Jordan Brand wants to start dabbling in golf. Keep an eye out for Keegan this weekend at the 2014 US Open, you never know what he may bring out next.